The year was 1978, and the Ladies Professional Golf Association was suffering an identity crisis. Growing up in Roswell, N.M., came an unidentified flying star, a Mexican-American girl whose father owned an auto-body shop. 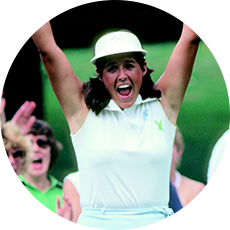 She won the state amateur when she was 12, two U.S. Girls’ Junior titles, an NCAA title, and, in 1975, she finished second in the U.S. Women’s Open. If this wasn’t the savior, then only God knows who was. Her name was Nancy Lopez, and it wasn’t long before everybody just called her Nancy. She won five consecutive tournaments in 1978, and everybody sort of hitched a ride on her skirt tails: the press, the fans, the sponsors, even the rest of the women playing the sport. 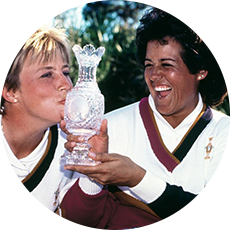 These were magical times for women’s golf, and nobody seemed to want to get in her way. 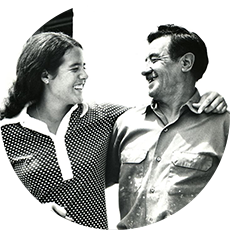 Looking back on these years Jaime Diaz wrote in Sports Illustrated that Lopez had burst on the scene with as much charisma as anyone since Babe Didrikson Zaharias. "I was determined not to fall on my face, though it is easy enough to choke yourself to death trying to win." Not even Zaharias had become a legend so fast. She was all of 21 years old, and the veterans marveled not only at her golfing ability, but her poise and maturity. “Never in my life have I seen such control from someone so young,” said Mickey Wright. “They’ve got the wrong person playing Wonder Woman,” said Judy Rankin. “We’re all trying to steal Nancy’s birth-control pills, but so far we’ve been unsuccessful,” said JoAnne Carner. After marrying baseball star Ray Knight, she struggled balancing her career with motherhood. By the time she was 30, Nancy Lopez still had won enough tournaments (35) to qualify for the LPGA Hall of Fame. At that point, she was Player of the Year three times, Vare Trophy winner three times and her stroke average in 1985 of 70.73 was then an LPGA record. Lopez had the ability to close. She was the youngest qualifier for the LPGA Hall of Fame and had to wait six months to be inducted as the rules for admission required that a player be on tour for 10 years. “I feel honored to be with the other women in the Hall of Fame,” Lopez said. “I have always respected them and what they have done for women’s golf. I look at each player, and some are already legends while others will become legends as time goes by. I feel I’m great now, being in the Hall of Fame, having accomplished what I’ve done and being with the greatest golfers. I feel great that I can say I’m one of them.” Lopez won her 48th tournament in 1997, and at the age of 40, finished second for the fourth time in the U.S. Women’s Open. She shot four rounds in the 60s-the first woman to do so-but lost by a stroke to Alison Nicholas.